This Saturday, at the Portsmouth market, we finally managed to find the coveted breadfruit. We'd heard they were delicious, but that they were going out of season and difficult to find. It was also hampered by the fact that I really didn't know what they looked like. But find them we did, and today we cooked one of them. 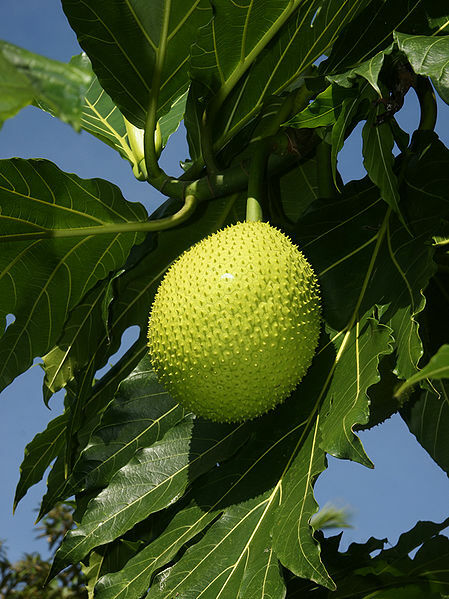 A breadfruit is about the size of a bowling ball. ﻿ When we looked up how to cook it, the trusty internet told us to treat it like a potato, and so I boiled and mashed about a quarter of it, and added some chicken stock for taste. Holy balls it's tasty. Denise thinks it's her favourite food so far. It tastes a lot like potato, but has a more solid, creamier texture. We looked up the nutritional information, and it is loaded with vitamin C, fiber and potassium. And we still have three quarters left! Though after that, it'll be pretty hard to find until summer. That's been one of the themes here, that is both frustrating and rewarding. Food is heavily dependant on the season. It's frustrating because restaurants will simply not have many things on their menus, and if you're craving a type of fruit or vegetable, you have to make due. The reward makes it worth it though, since you're forced to experiment (unless you want to eat beans and rice all year), and the results are almost always delicious. Other new acquisitions from the Saturday market were 1.5 litres of coconut water, and a sweet potato. Yum! Delicious food and frustrating deals. Dead bodies and some literature.